Dehydrating foods is an easy and convenient way to preserve nutritional foods you want to enjoy for weeks and months ahead. Dehydrated fruits and vegetables retain their nutritional value for several months when packed in airtight containers. The energy and sugars are concentrated in the dehydrated foods, so it takes less of the food to feel satisfied. Your home dehydrated fruits are better than the ones purchased in the store: they are less expensive, you know exactly what has been added (no sulfur) and you can package them in individual serving sizes you choose for you and your children. Next time you are shopping and find a great sale on organic fruits or certain vegetables, buy enough to dehydrate and be able to enjoy for months. 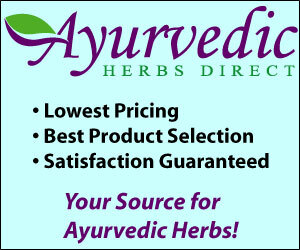 Dehydrators can be easily purchased in the range of $40.00 to $220.00. 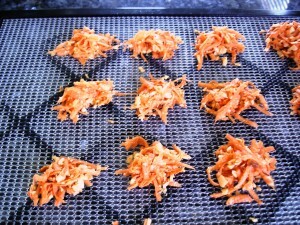 And, at the bottom of this page I share a link that tells how to dehydrate in your oven. Have fun dehydrating! Grate pumpkin meat and set aside. 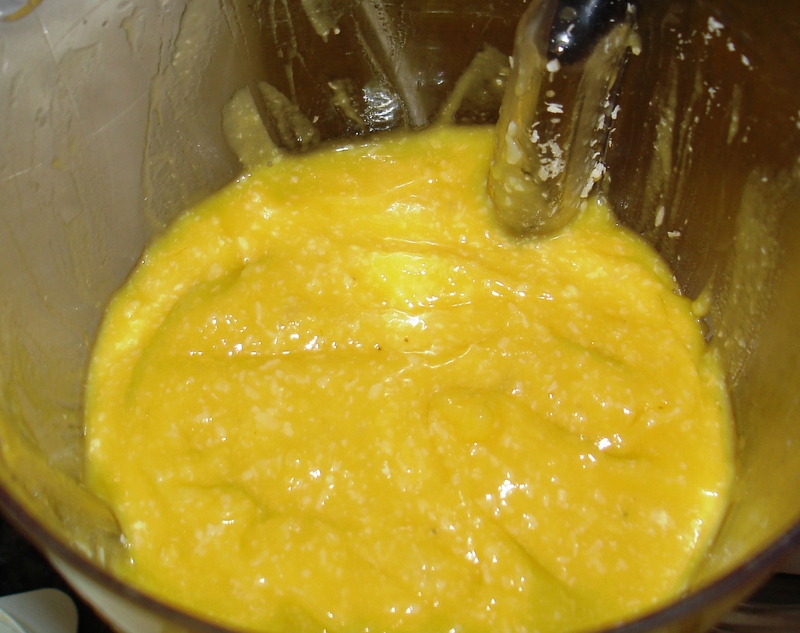 In a high speed blender or food processor, blend the dark orange pumpkin flesh, apple, honey, stevia, and dates until smooth and completly blended. Add raisins and pulse several times to chop. Scrape mixture out of the blender and into a medium bowl. 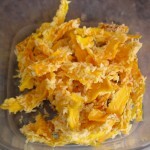 Add grated pumpkin, coconut flour, walnuts, spices, and sea salt if desired. Mix gently to incorporate all together. Mixture will be moist and will clump together. 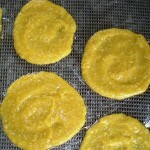 Drop tablesppon size mounds of pupkin cookie mixture onto dehydrator Paraflex sheets or parchment paper covered trays. Flatted cookie mounds with a fork so they are about 1/4 inch thick. Dehydrate for 10 – 13 hours at 105 degrees. Your house will smell incredible! Makes 3 – 4 dozen cookies. Blend ingredients together, excluding kale, in a food processor (Cuisinart, Vitamix, Omniblender, etc). Pulse machine to get mixture to blend up smoothly. Add additional water if needed to make mixture a “thick pea soup” consistency. Set cheesy coating mixture aside. 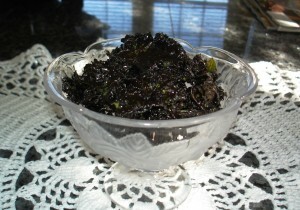 Remove curly kale leaves from large center spine and tear leaves into large bite-size pieces. I make my pieces about two-three inches across. They shrink in the drying process. 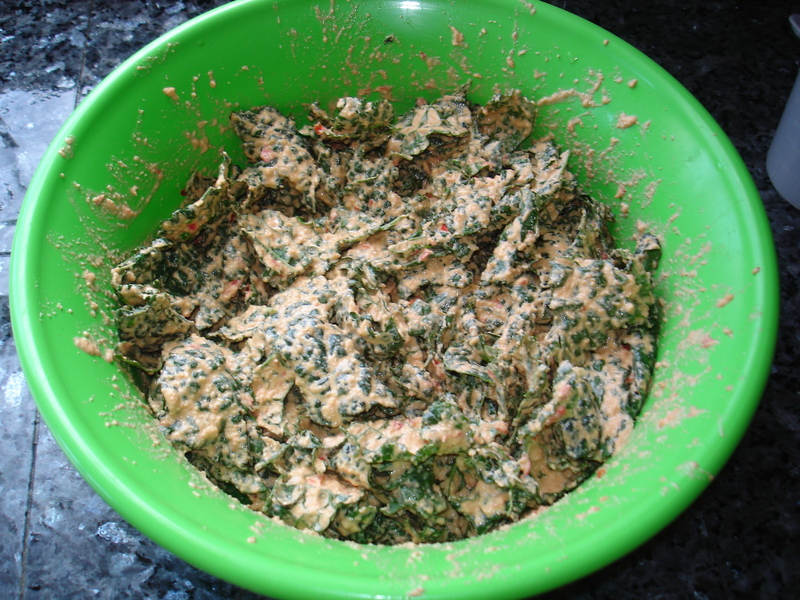 Place kale pieces in a large mixing bowl (I do about half the leaves at a time with half the cheesy mix, to get a more evenly coated leaf). Pour the cheese coating mix over the leaves and massage gently into all sides of the leaves with your hands. 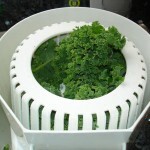 When kale leaves are evenly coated on both sides, transfer pieces to dehydrator shelves. 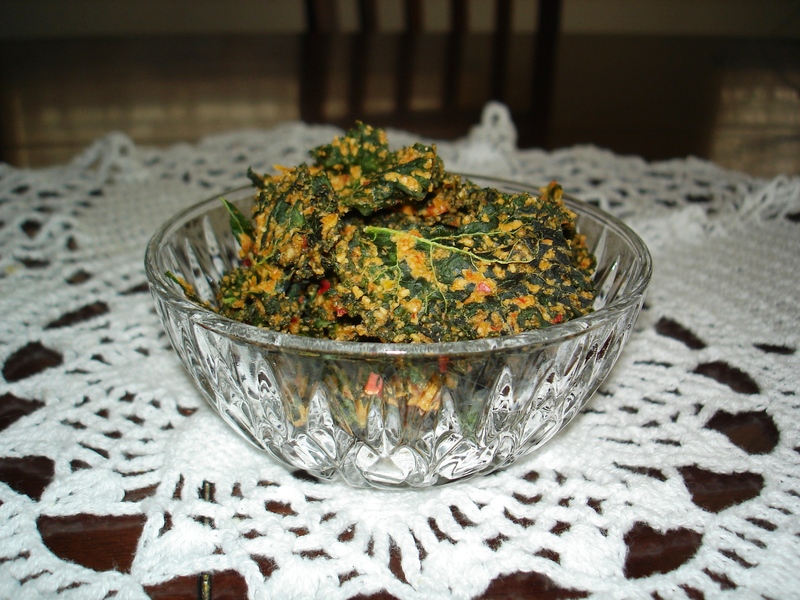 Place kale pieces in single layers. Dehydrate for 7-8 hours at 120 degrees until kale is very crunchy. When kale chips are dry and crunchy, use a spatula to transfer chips to air-tight containers to keep them crunchy. Recipe makes 3-4 quart sized containers full. They will keep for months. Of course, eat a few right away as they are simply irresistible! Enjoy and share. 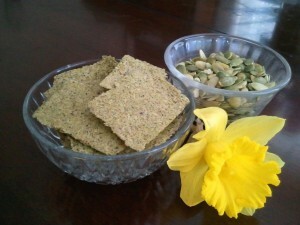 People love Cheesy Garlic Kale Chips! One-eight teaspoon each; nutmeg, cinnamon, and dash of sea salt if wanted. 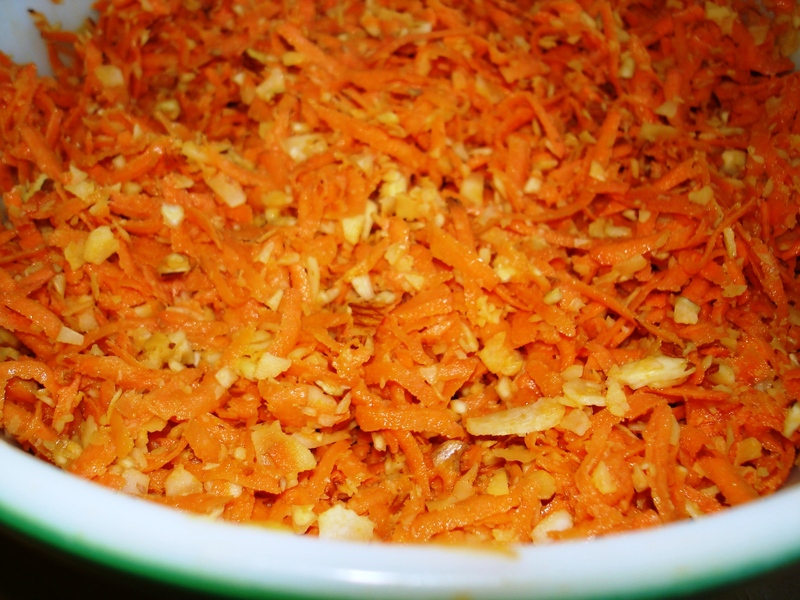 Grate sweet potato (or spiralize) into a mixing bowl. 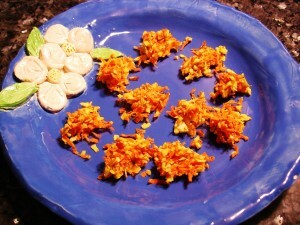 Add finely shredded coconut and ground almonds, oil, sweetener, and spices. Mix well with hands or spoon. Mixture will be slightly moist and will clump together. 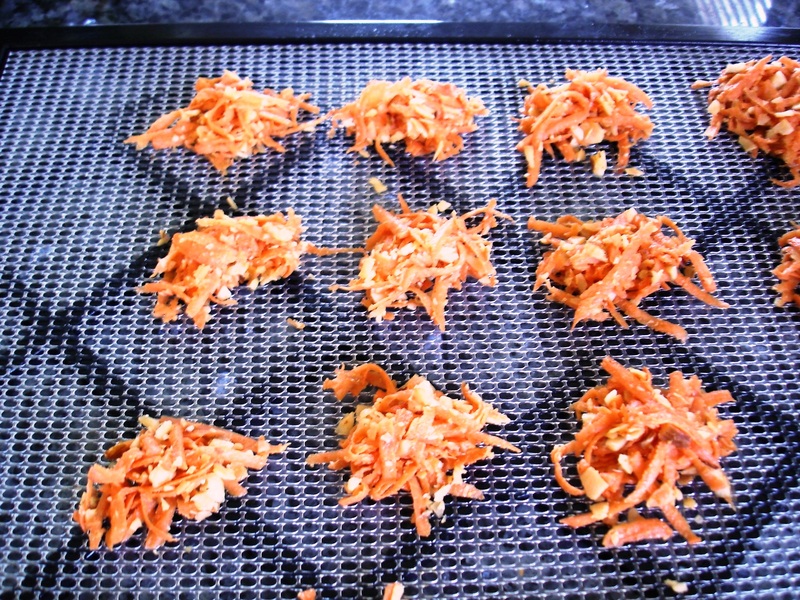 Drop heaping teaspoon size mounds (“haystacks”) of sweet potato mix onto dehydrator screens, with a little space between mounds. Mounds can be slightly flattened with a fork so they are not too high to fit into dehydrator without getting smashed by other shelves. After all sweet potato mixture is mounded on screens and loaded in dehydrator, set temperature for 120 and dehydrate for about 7 hours. 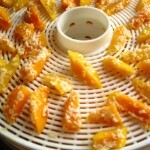 Check after six hours, as dehydrator models heat differently. When Haystacks are crunchy and completely dry, gently remove from screens with a small spatula and store in layers in an airtight container. These will last for months in the refrig, or two months stored in container at room temperature. Makes 60-70 small haystacks. Delightful for snacking, as an appetizer, or a luncheon side. 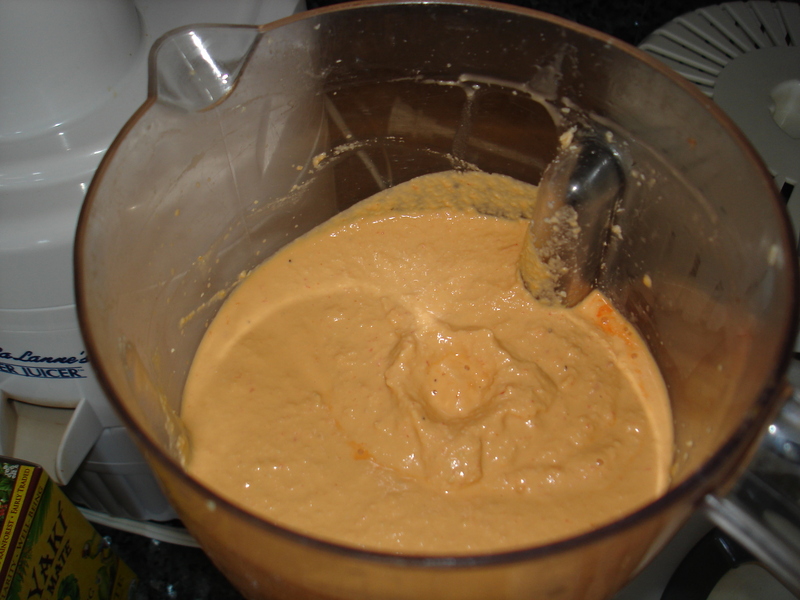 Blend all ingredients together, in a high speed blender until mix is mealy looking but evenly colored (Health Master, Cuisinart, Vitamix, Omniblender, etc). Spoon cracker mixture out, in large squares or circles, onto Paraflex dehydrator sheets. 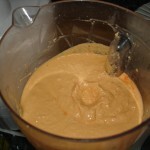 Flatten the pulp mixture to one-fourth inch thick with the back of a large spoon. Or, you can lay a piece of parchment paper over the mixture and using a rolling pin to flatten the shapes to one-fourth inch thick. 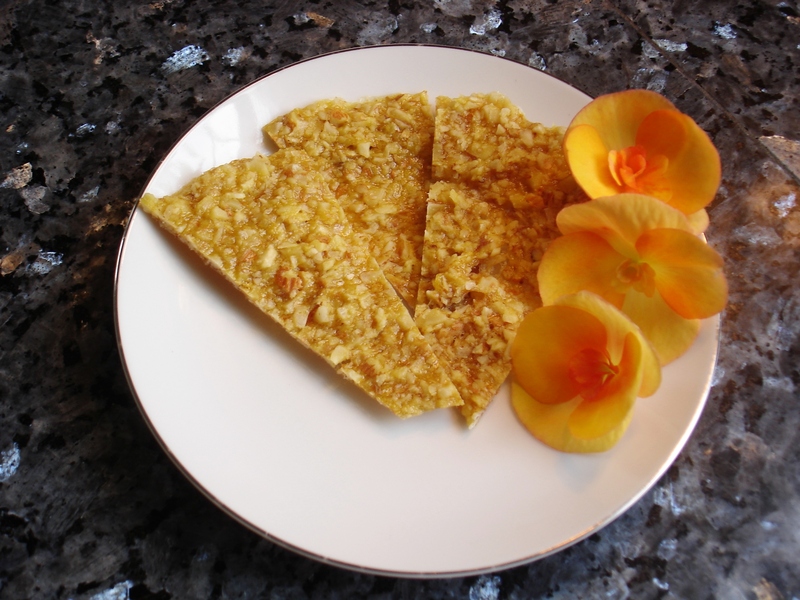 Take parchment paper off before dehydrating. Score the pulp mixture as in the photo, to be able to turn them over when surface feels dry to the touch. Dehydrate the crackers for six-seven hours at 110′, until top side of cracker feels dry. 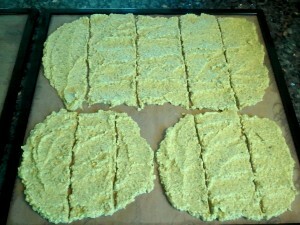 Flip the crackers over and dehydrate the other side another one- two hours until completely crispy. Remove racks to cool for ten minutes, break crackers into pieces, and place in an airtight container. Crackers will keep for three weeks room temp. or five months in the refrigerator. I bet they don’t last more than a week or so! Makes enough for eight generous snack servings. 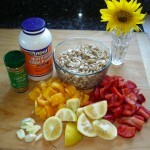 Blend all ingredients together, in a high speed blender (Health Master, Cuisinart, Vitamix, Omniblender, etc). I did not add any water, but the thawed blueberries did included some juice. Coat your Paraflex sheets, (or parchment paper) with a thin film of grape seed oil. Spread oil with a thin towel. Pour the berry mix over out onto Paraflex sheets into two inch circles. Flatten the mounds into four inch patties about 1/8 – 1/4 inch thick. 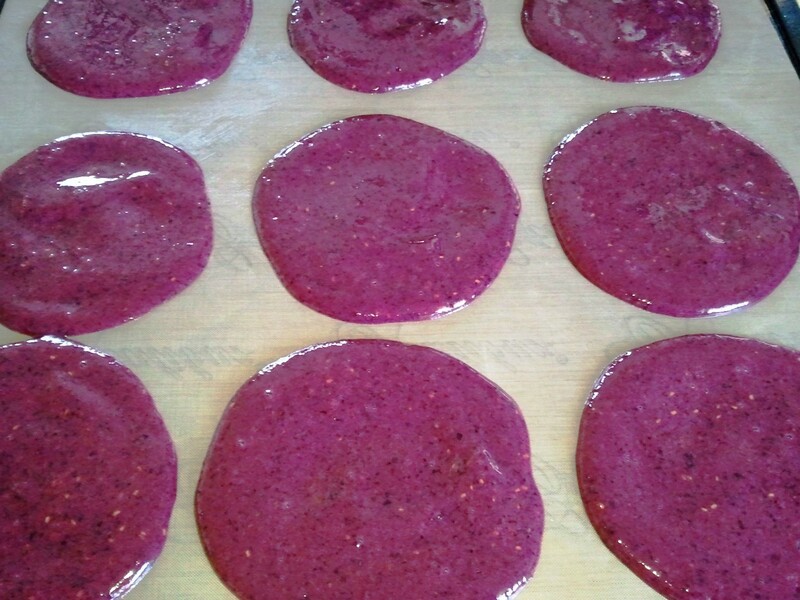 Dehydrate for 7-8 hours at 110 degrees until berry circles are dry to the touch. 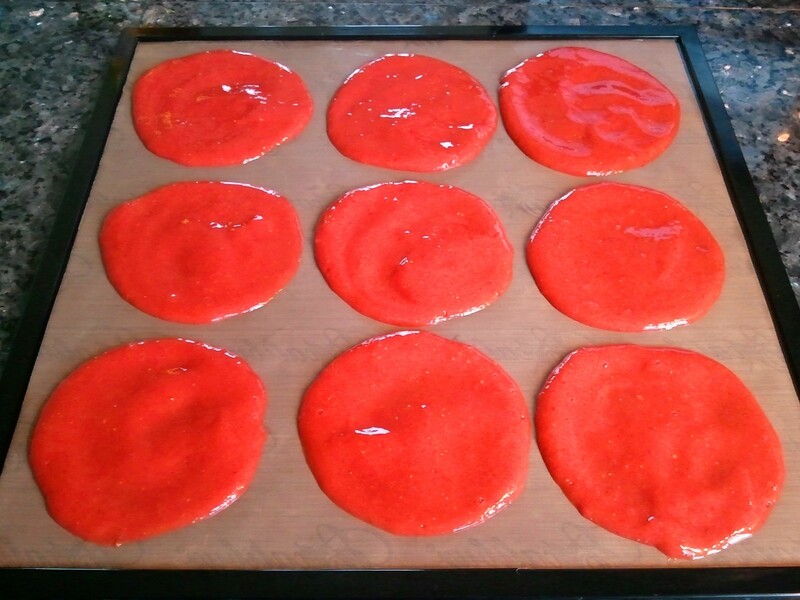 Turn fruit leather circles over onto regular mesh screens and dehydrate another 45 mins until dry on top again. Remove from trays and place in an airtight container, (after you enjoy some fresh warm fruit leather, of course!) 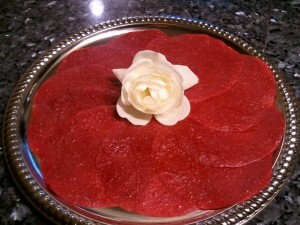 Fruit leather keeps at room temperature for 6 weeks or in the refrigerator for 6 months. 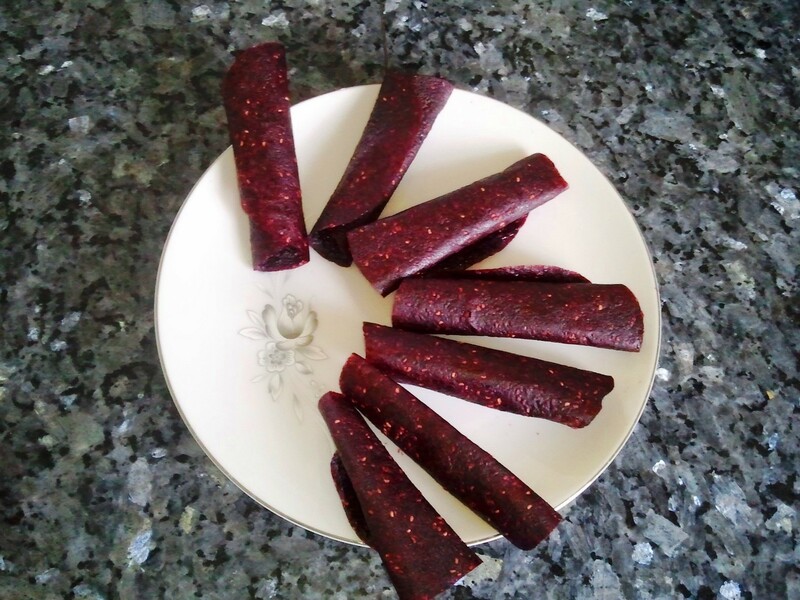 This fruit leather truly sparkles with flavor, vitamins, and nutrients in your mouth! Great for lunch boxes! Juice limes over a screen (to catch seeds) into a small cup with a spout. 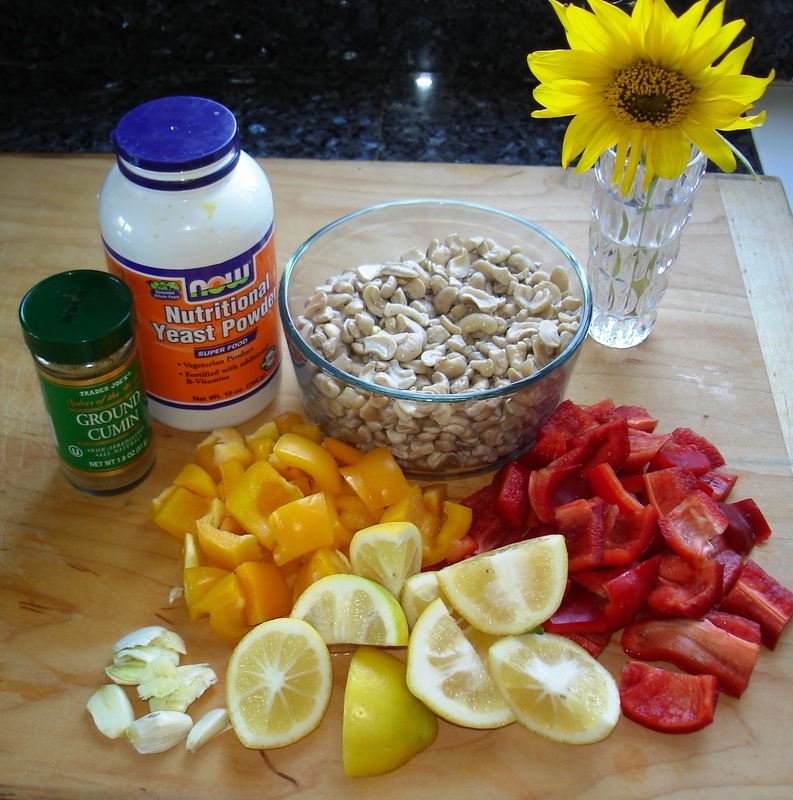 Peel mangoes thinly, cut each one off the large seed and into a food processor or blender as you go. Drizzle cut mango with lime juice before peeling and cutting more mango. Do for all five mangoes. 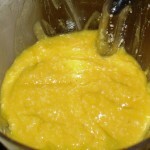 Blend mangoes and lime juice until smooth. 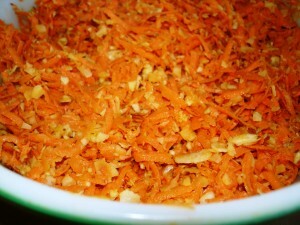 Add shredded coconut and ground almonds and process until mixture is smooth. Ground almonds should be in very small bits, but not ground into almond meal. 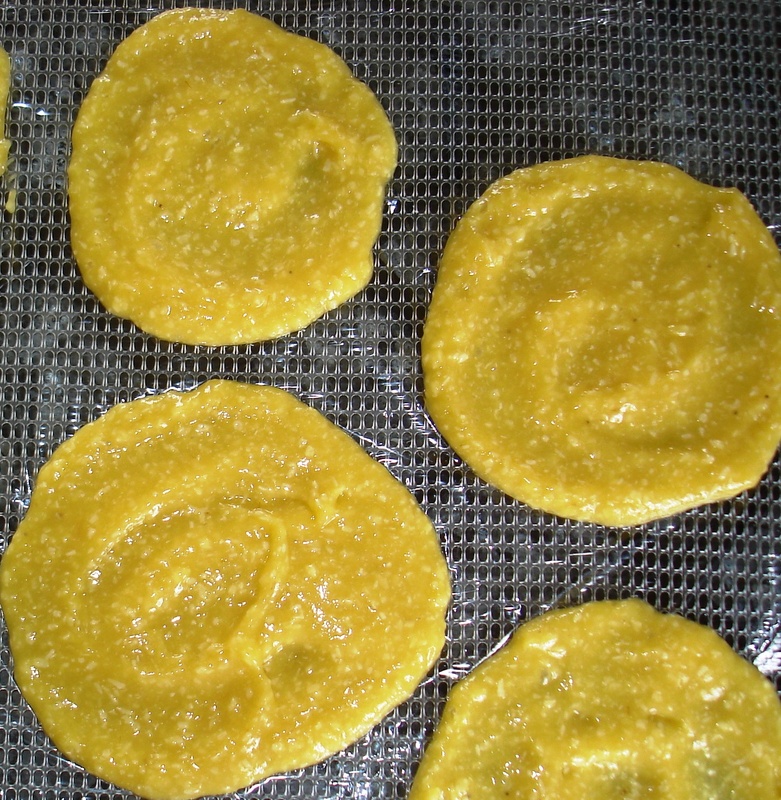 Spoon blended mango mixture onto dehydrator screens covered with parchment paper. I made 3 to 4 inch wide mango patties to be able to control the thickness of the mixture and make drying more consistent. I like this strategy, as opposed to a large layer of leather that is thicker in parts. Turn dehydrator to 130 degrees and dry fruit leather for 8 hours. Fruit leather may need to be turned over to let other side dry for 45-60 mins more. Leather will be dry and not sticky to the touch when finished. 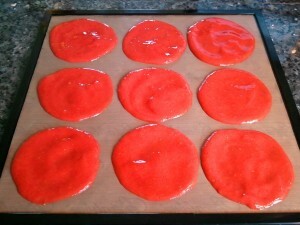 Peel fruit leather off the parchment paper and store in airtight containers. Layers of leather can be separated by the sheets of parchment when stored, if desired. I store mine without separating the layers. Fruit leather will keep in the refrigerator for a year or more, or at room temperature for 1-2 months. Enjoy the rich, tropical, and chewy flavor surprise of this fruit leather! Wash the kale in cold water. I rub each leaf gently with my fingers on each side to get any hidden soil from the curly leaves. 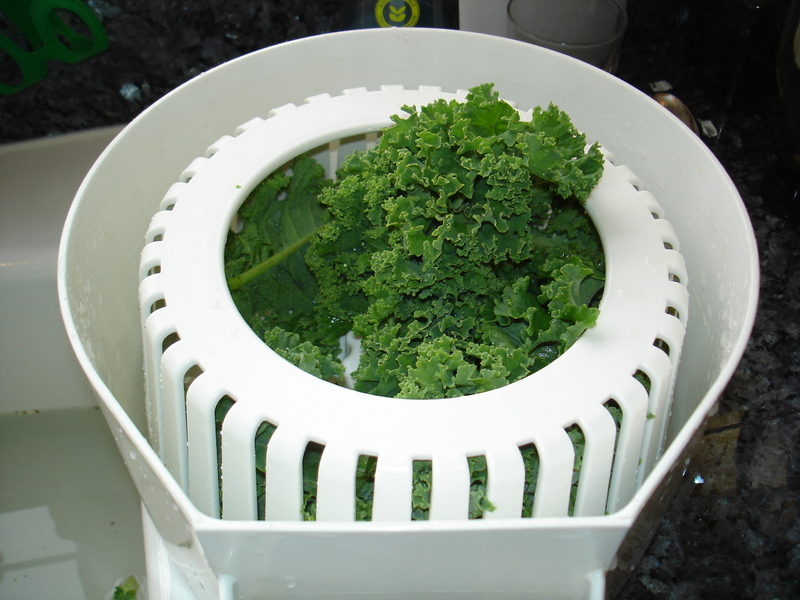 When kale leaves are clean, shake excess water off leaves and place them in a salad spinner, or dry leaves with a soft towel. I break the leaves in half before I put them in the spinner. They seem to get more dry that way. Remove the large center spine of the dry kale leaves by tearing the leaf off in bite size pieces. 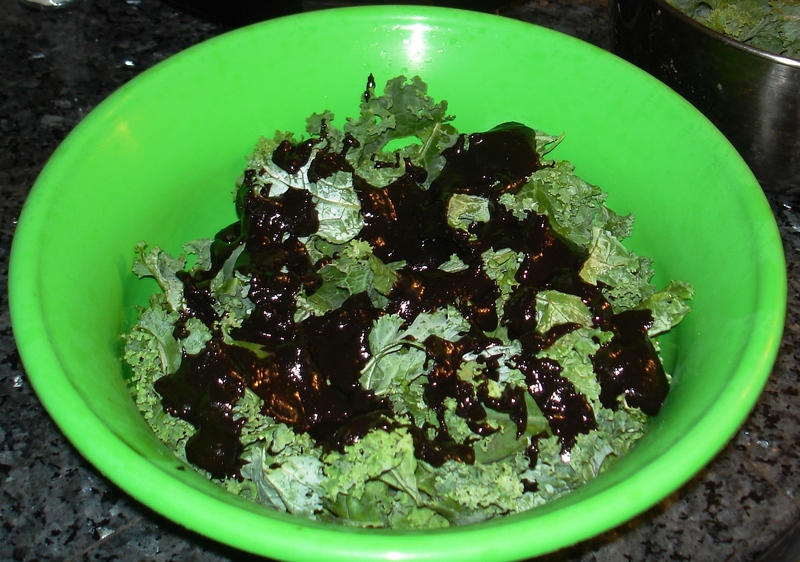 Set dry kale pieces aside and blend the chocolate coating ingredients. Drain the water off the soaked cashews and add all the other ingredients (except the kale and coconut flakes) to a Vita-Mix or blender. Pulse the blender and alternately stir the mixture, to incorporate all ingredients and make it a smooth cocoa mixture. 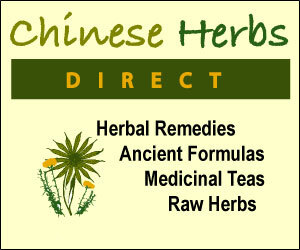 You may add small amounts of water if needed. 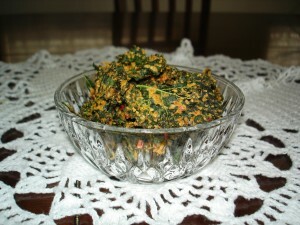 Pour this mixture over the bowl of washed, de-stemmed kale leaves. 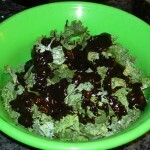 The best way to coat the kale with the chocolate mixture is to massage the sauce gently on all sides of the kale. Yes, your hands get all chocolatey. If you have children, they would love to help with this part! 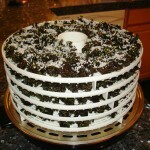 When kale is evenly coated on both sides of leaves, transfer pieces to dehydrator shelves. Place kale in single layers, to dry completely. Dehydrate for 8- 10 hours until kale is slightly crunchy. 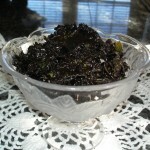 If you want coconut on the chocolate kale, sprinkle each tray of kale with coconut flakes BEFORE dehydrating. 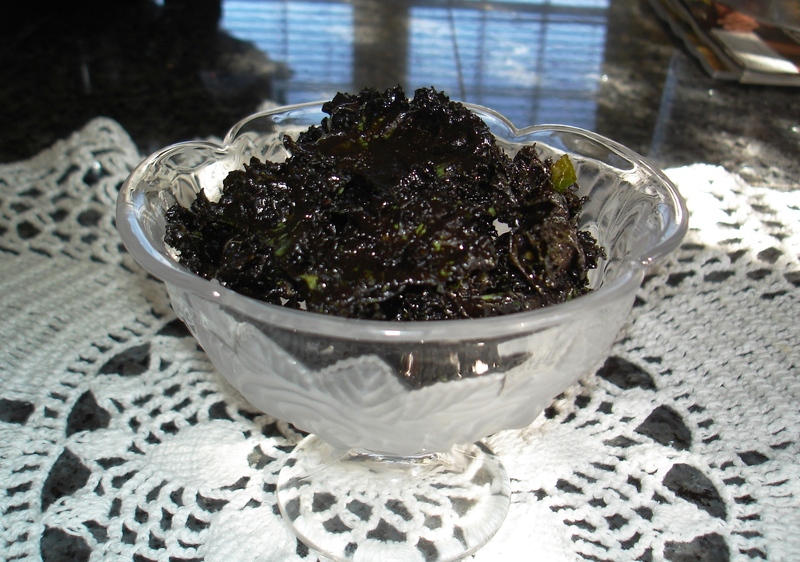 If you do not have a dehydrator, transfer chocolate kale to a cookie sheet sprayed with canola oil and bake at 300F for about 20 minutes. Flip, and bake for another 10 minutes, give or take. Be careful to not let the kale burn. You will be able to smell if it is burning. 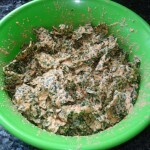 Move the finished kale chips to air tight containers, but also serve some to friends and family while they are fresh. 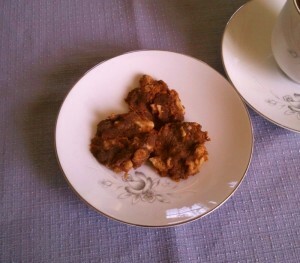 This is a delicious, decadent, and nutritious treat! Juice the 2 limes into a medium bowl, strain out any seeds or pulp. The lime juice keeps the fruit from turning dark during the drying process. Add the water (and agave nectar if desired) to the bowl. Set aside. 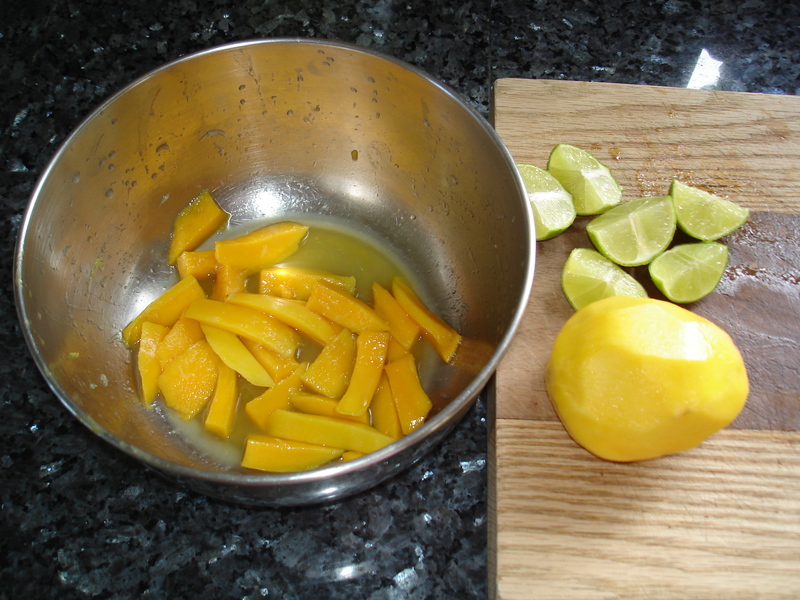 Remove peel from the mangoes with a sharp paring knife, being careful to not cut deeply into mango fruit. 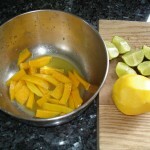 As you peel each mango, cut the fruit away from the pit in bite size portions and carefully place them in the lime/water mixture. When all the mangoes are peeled and cut up in the lime/water mixture, let them sit for 5 mins while you get your dehydrator shelves ready to load. 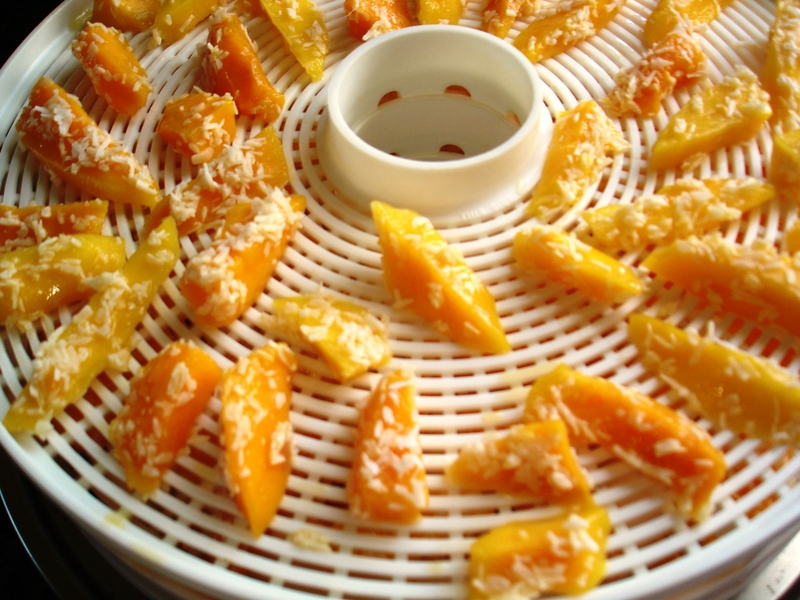 After mangoes have all soaked in lime water, use a small spatula to carefully lift them out and place them on the dehydrator shelves. (Some people like to spray the shelves with a light organic spray oil first.) As each shelf is filled with mangoes sprinkle the coconut on each piece with your fingers. I have also made these and added the coconut into the lime water mixture at the end before putting fruit into the dryer. Both methods work great. 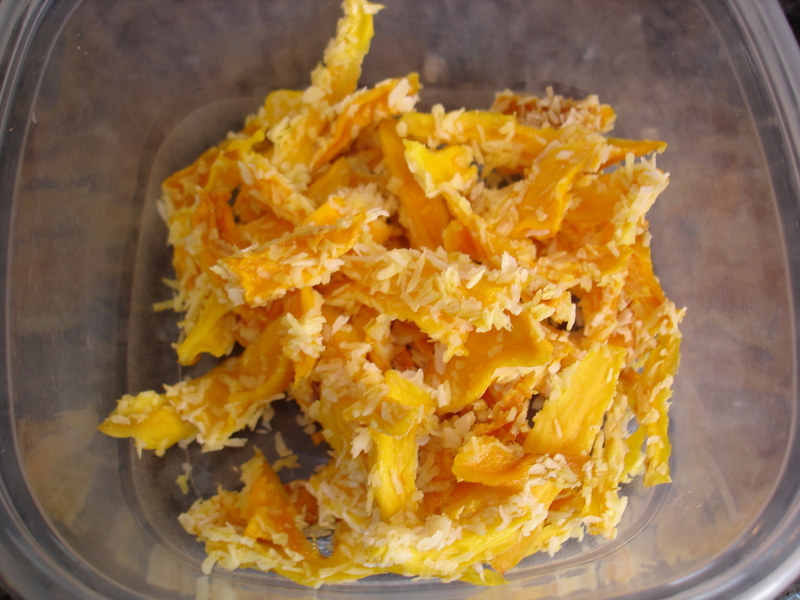 Dehydrate the fruit for 10 – 12 hours, or until the mangoes are dry to the touch and reduced in size. Transfer to airtight containers to store for the future, but enjoy some immediately as well! Here’s the method to dehydrate in your oven. Thanks to E how Food. Preheat oven to lowest temperature (about 140 degrees.) Your oven may not go that low but temperatures up to 170 degrees can be used. Prop the oven door open about two to three inches by putting a folded kitchen towel in the door. This will allow moisture to escape, air to circulate and prevent the oven from getting too hot if you can’t set it to 140 degrees. Be sure to turn the food occasionally to allow for even drying.